Sorry to have been a no show for some time now, but hopefully soon to remedy that. That looks beautiful. The pastrami I made from brisket was disappointingly tough. Yours is clearly not brisket. I'll be watching with interest. Ok I want to try. My brisket pastrami has been out of this world. What cut of meat? How long do you smoke it for? To a specific IT? This is a copy from the update on my fb page ………. It has been sometime since I posted and it has not been for the want of trying but being a one man producing all of these delightful treats takes some doing. Here is an update of a challenge that I was given by a very good friend who is the Executive Chef at the North Shore Winter Club. Kevin and I meet up October of last year at a food show that was in town, the challenge for me by going to these functions is to see what is out there and to see if anything will get my senses flowing for something new. Kevin on the other hand was I believe looking for things that he could use as ‘good wholesome food’ rather than the ‘chicken nuggets’ that most places seem to cater to. On doing the circuit around the show Kevin started to sample some Montreal Style smoked meats as well as some Pastrami. There was banter going on between the two of us on trying to see/find which out of the dozen or so which one was the best …… sadly to say nothing hit the mark or in my case came anywhere close to what I had sampled at my son’s place when we was back in Toronto and even that I felt I could do better. All the products that Kevin and I sampled where good in there own rights ….. if that’s what people are all about and like the run of the mill things (so to speak). On returning to the North Shore Winter Club we had a discussion over coffee on the pros and cons on what we had tasted ……. Too dry in most cases and a lot of them was lacking flavor, as there was now ‘wow’ factor involved. 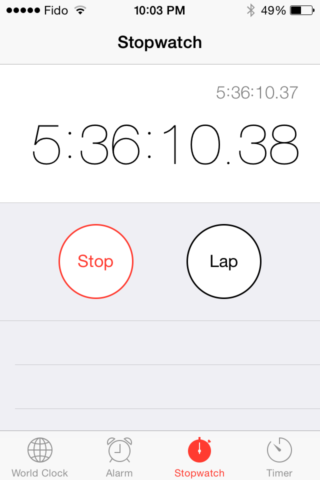 It seemed like most (if not all) was like ‘slam, bam, thank you mam lets get it out the door thing. Nothing to say ‘I want/need more’, no lingering flavor tantalizing the flavor buds in the mouth long after it had been eaten. My problem was to transpose that flavor into something that was a solid muscle that could be sliced thinly without shredding like mine did. The challenge came within less than half hour from Kevin; off he goes to the freezer and pulls out what he think’s is a beef brisket and tells me to make something good Pastrami/Montreal smoked meat out of it. It seemed that we was back to the days when he and David Long ran the kitchens at the Terminal City Club and ‘always’ turning out awesome food. After some checking and tracing back in time we find that Pastrami is a North American thing and seems to originate from Romanian and was a way of drying/preserving/curing meat for long keeping. With so much going on at work and trying to fit urgent request in (bacon for a close friend who has passed away but not before receiving the requested bacon) The Pastrama got left behind. Monday last I paid a visit to my good friend Kevin to see how things are over on the North Shore and during the coarse of our conversation the Pastrama was mentioned, not wanting to look total out in left field I told him it was coming along nicely. It seems that yesterday (Tuesday) I had a window of time that needed to be filled and what better than getting the Pastrama on its way to be finished. 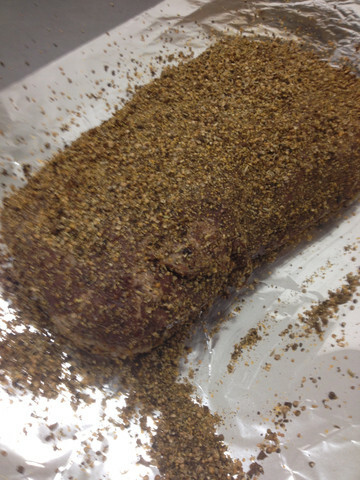 Thinking about the cooking procedure (I had wanted to do a souse vide method but lacked the tools) was an art by itself ended up cooking in the oven for six hours after giving the meat a quick rinse and coating it with a spice rub that I had blended and ground up. After a long and daunting task of slow cooking the beef was left to cool and rest overnight so that it would retain as much moisture as possible. Due to the fact that I do not as yet have a Sous Vide circulator I used the (gas) oven using the method that was shown to me by Vagreys while doing the pulled pork while up this way. 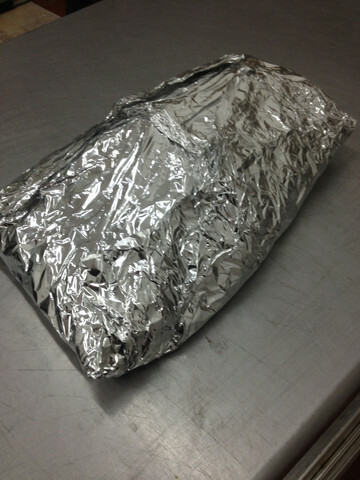 I wrapped the beef in three layers of foil to keep the moisture in. Hope that you find the above worth the wait; sorry it has taken so long. This was a fun project to do with much help on the research by Vagreys of which I am grateful and has been well received by the client. On a side note; I was going to add some smoked paprika to the final rub but as with Murphy’s Law it did not show up in time. I want to believe that with using the ‘smoked salt’ that there would be enough smoked flavor but to be on the safe side I added three/four drops of liquid smoke that I have on one side for experiments such as this. That is beautiful. Thanks for all the excellent photos. So that is bottom round. I will try that next time instead of brisket. I've also only done a wet brine cure, never a dry cure. I may have overlooked this, but how long did you leave the meat to cure? Also, do you calculate the amount of cure to use the same as you would for dry-cured bacon? Tasso wrote: That is beautiful. Thanks for all the excellent photos. So that is bottom round. I will try that next time instead of brisket. I've also only done a wet brine cure, never a dry cure. Because of work conditions I kind of goofed and I am glad in a way that I went old school rather than using my AP curing salt. wheels wrote: Is 'bottom round' silverside? I just wondered; it looked like it, but I get confused with the UK terms for US/Canadian round. What did you and vagreys find out about the difference between pastrami and Montreal smoked meat? i'm putting together a little information sheet comparing the two. NCPaul wrote: What did you and vagreys find out about the difference between pastrami and Montreal smoked meat? Looks amazing BriCan!!! I want some of that now ... in my belly! 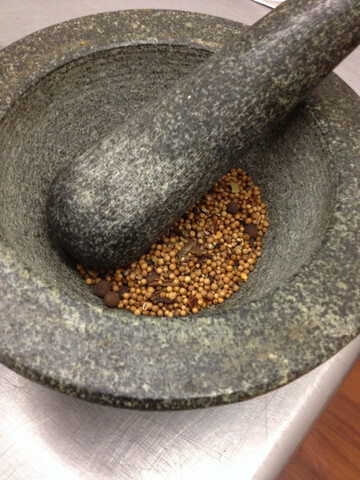 -	Toast the fennel, mustard, and coriander seeds then combine all of the rub ingredients together in a large bowl. 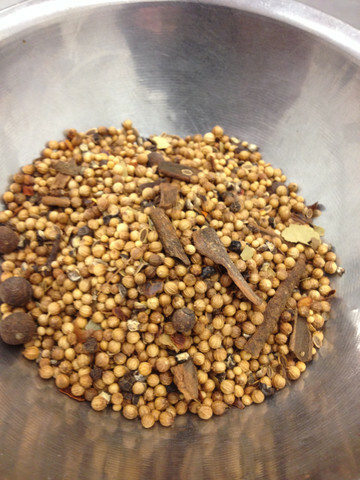 -	In a large pot, combine all the ingredients for the brine and stir well. 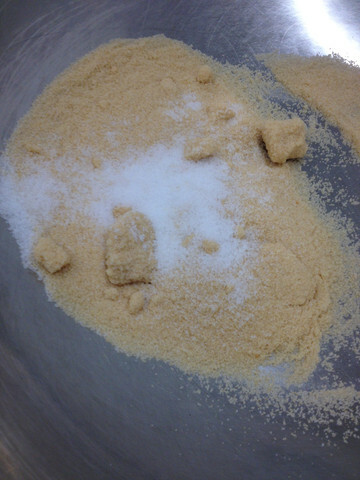 If not dissolving you can gently heat the brine but make sure to add the Cure #1 after removing from heat. Chill before pouring over meat. 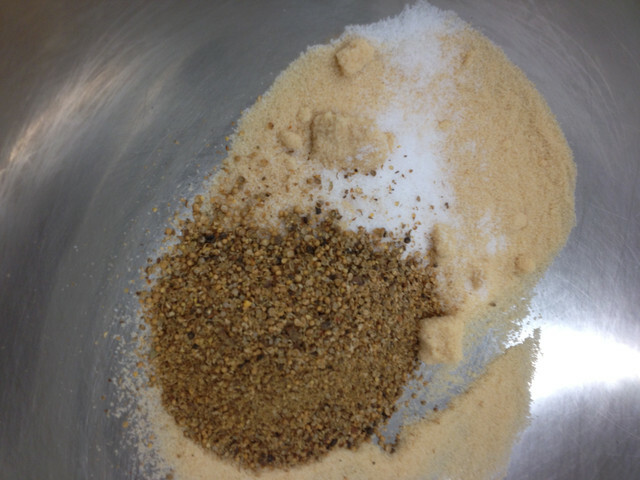 -	Clean the brisket of large mounds of fat if desired. 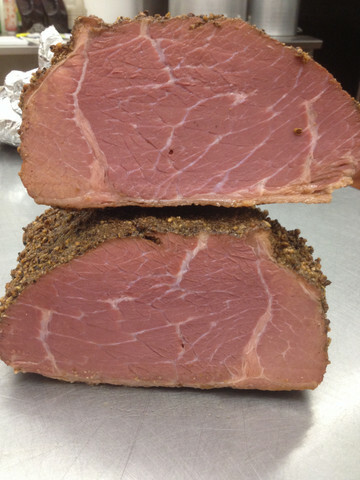 Traditional Montreal Smoked Meat is done with a double brisket with very little fat trimmed from it. 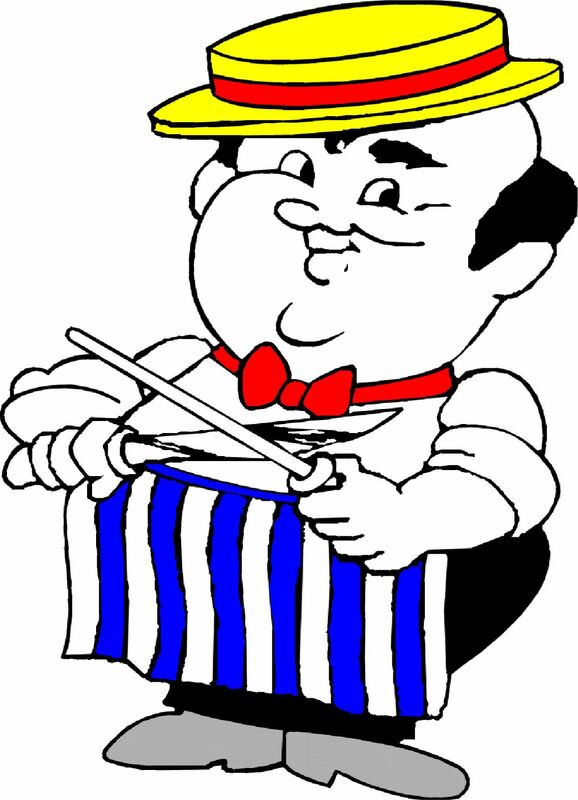 The customer then has the choice of lean, medium, or fatty cuts … trim to your liking. Typically the point and flat are left together as the layer of fat between the meat is considered a good thing. If you don’t like it simply separate the point and flat and save the point for a separate use. 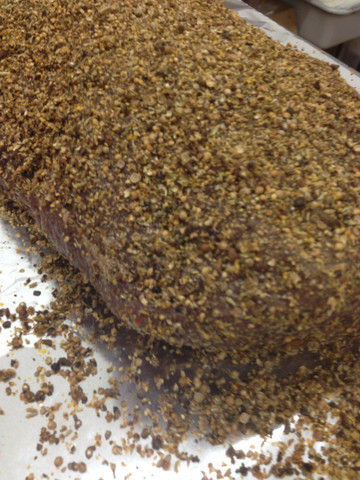 -	Rub a generous coating of the rub all over the brisket, using roughly half the amount or so. The remaining rub will be used later. 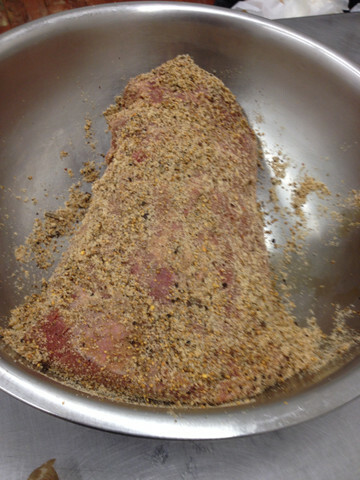 -	Place rubbed brisket in a large plastic or glass container (no metal, it will react) and pour the brine over top so the entire brisket is covered. You will need to place a weight over top of the meat (a plate or something works well – again not metal) to keep the brisket submerged. Cover and place in fridge. -	Brine, turning every day, for 1 to 1.5 weeks. 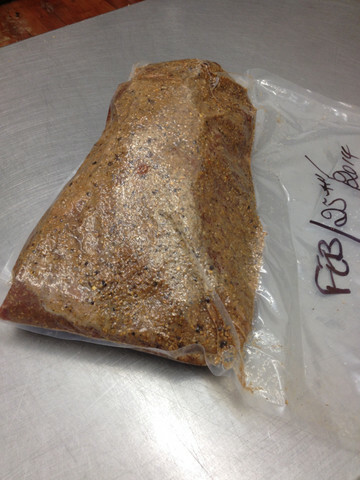 -	Remove from brine, rinse and then soak the cured brisket for 3 hours, changing the water every hour or so. Remove from water and pat dry. Leave brisket in cool dry place for a few hours to allow it to form a pellicle (this is a sticky surface on the meat that allows better smoke absorption) either on a rack in the fridge or in a drafty area or in front of a small fan. 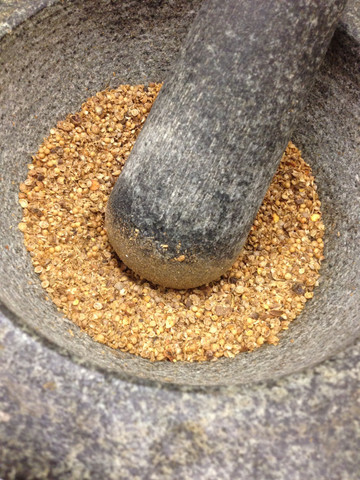 -	Using the reserved rub from earlier, rub the entire outside of the meat. 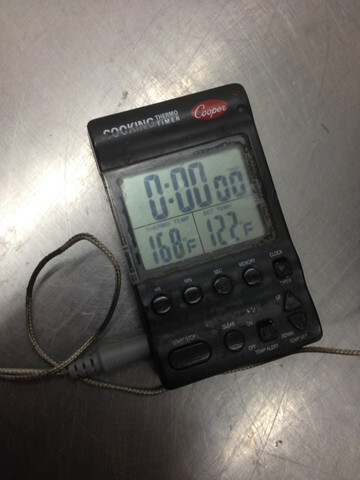 Place in smoker and smoke for 1-2 hours at 150F then turn heat up to 200-220F until an I.T. of 165F is reached. 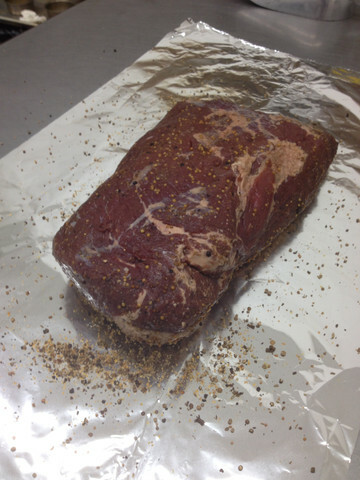 -	Remove from smoker and allow to rest wrapped in foil and some towels for a few hours. -	Prior to serving, remove from wrap, place on a rack over a large roasting tray, add reserved liquid from the brisket as well as some water (or just water) so it sits below the rack holding your meat. Place on stove and heat so the water gently steams the brisket until the brisket is very tender but not falling apart. Remove from steam. 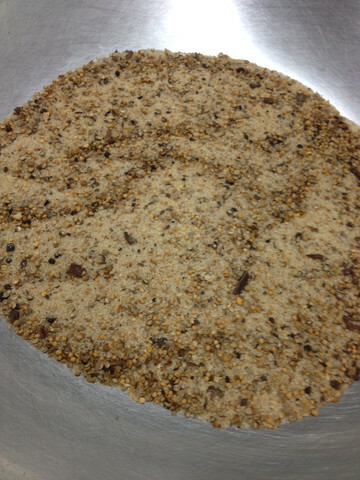 -	Hand slice thinly and pile high on some good Jewish rye with a high quality deli mustard. Serve with a sour pickle or half sour pickle (kosher style) and enjoy!